Bio-Rad Laboratories Inc. (NYSE: BIO and BIOb) today announced the launch of the ChemiDoc MP Digital Imaging System. The imager combines the industry’s best performance with ease of use and is ideal for researchers who need reliable, reproducible fluorescent western blotting data. The system offers high-resolution DNA and protein gel documentation features and its chemiluminescence detection sensitivity matches that of traditional X-ray film. The ChemiDoc MP System is a one platform solution that meets all researcher needs for blot and gel imaging. Fluorescent imaging enables researchers to quantify multiple proteins in a single measurement, an advantage over chemiluminescent western blots that require stripping and reprobing or cutting membranes to measure different proteins. Also advantageous is obtaining more data from less sample, especially when researchers want to study different isoforms of proteins or evaluate expression and interaction in complex pathways. With the ChemiDoc MP Imaging System, researchers can detect a larger portion of the light spectrum than ever before. The system, which has five fluorescent channels, can detect both visible light (RGB) and near infrared (NIR) fluorescence, allowing simultaneous detection of up to three proteins on a single blot. Traditional fluorescent scanners, in contrast, are limited to detecting only NIR signal and up to two proteins simultaneously. ChemiDoc MP Imaging System is the most sensitive system available for both fluorescent and chemiluminescent detection. In a side-by-side comparison of the ChemiDoc MP Imaging System and a traditional fluorescent laser scanning system, the ChemiDoc MP Imaging System provided greater sensitivity (Figure 3). The ChemiDoc MP Imaging System gives researchers the best results available when performing stain-free total protein normalization (TPN), a method referenced in more than 400 peer-reviewed papers since its 2010 introduction. TPN, endorsed by the Journal of Biological Chemistry as the preferred method for normalizing protein expression levels, normally requires a staining step that can be time-consuming and error prone. Using the ChemiDoc MP Imaging System when performing stain-free TPN eliminates this step by using a polyacrylamide gel chemistry to make proteins fluoresce directly in the gel. For scientists who want to continue using their validated housekeeping proteins for protein normalization, Bio-Rad offers human fragment antigen-binding primary antibodies labeled with rhodamine for use as common housekeeping proteins. Bio-Rad generates these using HuCAL® technology and they can be used with other primary/secondary antibodies from different species without cross-reactivity. These labeled primary antibodies offer a method for one-step detection of housekeeping proteins — without the need for a secondary antibody — that is more reliable and easier to use than traditional anti-housekeeping antibodies. 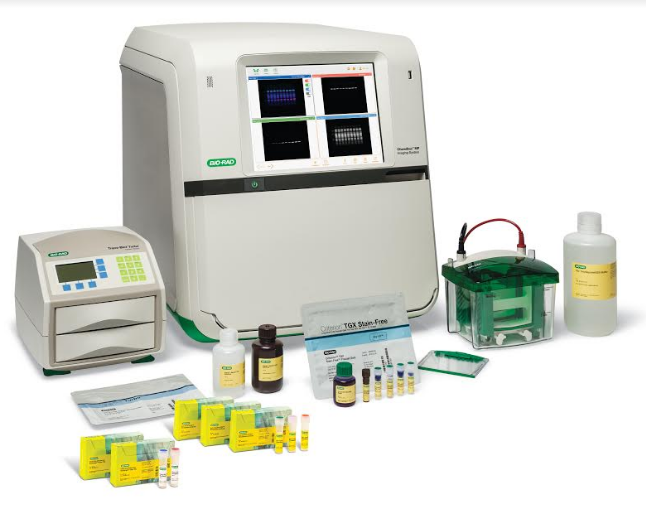 Like other Bio-Rad instruments, the ChemiDoc MP Imaging System is intuitive and user-friendly. Features include application-driven selection of optimal light sources and filters along with help overlay screens that allow researchers to tap, explore, and learn in minutes.